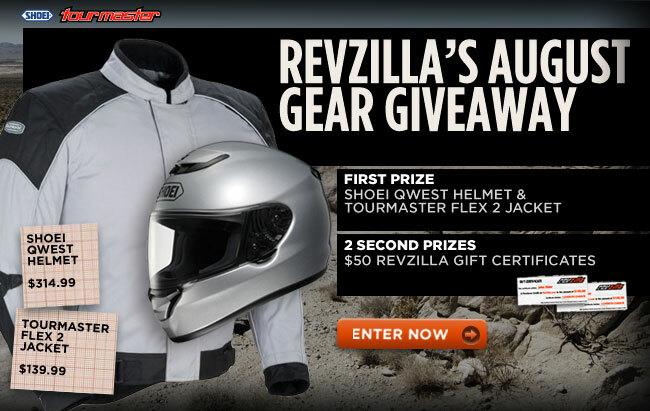 Tilted Horizons: RevZilla giving away gear again! RevZilla giving away gear again! Quick, take advantage before Revzilla comes to it senses! Zap on over to RevZilla's August contest page, answer the poll question of the month, create a Rider Profile (takes all of 30 seconds), then sit back and wait for the monthly winners to be drawn. The First Prize winner this month will receive a Shoei Qwest helmet and a Tourmaster Flex 2 jacket (that's about $455 worth of top-shelf motorcycle gear!). Two Second Prize winners will receive $50 Revzilla gift certificates.